The PC age is transforming into a Mobile age and its essential that our blog is compatible to load on mobile gadgets. Blogger service is improving each day and now you can actually have a mobile version of your blogger blog without much efforts. This is a tutorial to add a Mobile version widget to your blogger blog. Here is a list of steps you need to follow to get a Mobile version enabled link which will help your readers view your blogger blog very fast on their mobile devices. 1. Just go to Blogger Design Mode. 3. Copy below code snippet and save. 4. You can now see a cute android Icon with Mobile Version written below it. 5. Below is a sample image of how your blog will appear in mobile version. 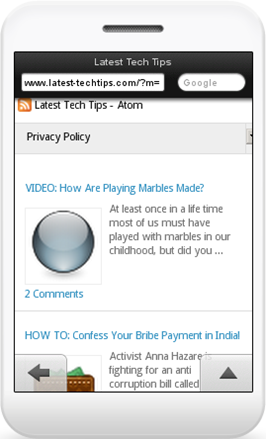 That's it you have just enabled mobile version of your blogger blog for your readers. If you liked the trick then share it with your blogger friends, Cheers and Enjoy..